We rode into Marcigny past a supermarket and industrial units to a neat little market town. The tourist office was well signposted so we got off the bike and walked to it. The young woman was lovely, and although she spoke English even less well than we spoke French, she insisted on doing so and quickly identified the hotels and chambers d’hote we could stay in, mostly through pointing an mime. Hotels are cheaper and dodgier. No-one was answering the phone at our chosen hotels so we walked round. The bloke shoo’d Lou out of our first choice. No, we could not stay. We went for the second choice, the Globe Hotel, which I’d seen on the way in. It said it was open on a big chalk board outside, but it was locked up. A woman came up and asked if she could help. It was her hotel. After locking up her savage dog, she let us in. We left our bikes in a tumbledown outbuilding. Our room was grim but functional. We cleaned up and went out for tea. A quick stroll around confirmed we were in town with half day closing on Tuesdays. Grrrr. Suddenly the rain came down with incredible force. We hid in doorways until it stopped and then I rejected eateries out of hand in search of somewhere with fresh vegetables on the menu until we settled on Chez Renee. We sat in the bar area by the window. I think we were supposed to go through to the restaurant. We didn’t opt for gizzard salad, but the innocent looking one I selected had three different types of ham in it. We traded ingredients so we each had a reasonable starter. I had coquilles St Jacques in Champagne with chips. Lou had trout. I had some Macon blanc in a little brown jug as we were in the neighbourhood. It was heavenly. I still haven’t poo’d in France. This is a problem for me on long distance trips. The combination of unfamiliar surroundings, dehydration, a change of water, sitting down all day, and a change of diet play havoc with my innards. Café Renee had a weird shrink wrap on the loo seat which moved around when you pressed a button, to ensure fresh shrink wrap on your bum. It did not however have a door on the men’s urinals. An interesting investment decision, but not one that made it easy on my holiday constipation. It turns out it’s a real thing and I’m not the only person to suffer from it, so I admit my travel poo problem with pride. 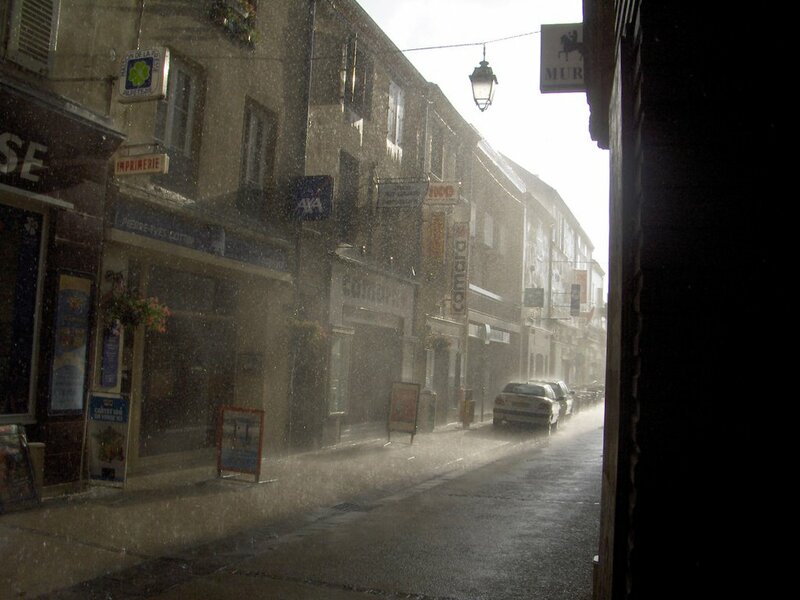 The rain in Marcigny really was torrential, and unlike other cycle pilgrimages we’ve undertaken, rain became a regular factor of our trip through France. In some ways it’s better than blistering sun as it does no painful damage to you, and doesn’t make you ill, but it is depressing, and feeling the squidge of water between your toes as you pedal does not inspire stellar performance.